Conspiracy theorists claim that ancient artwork could hide signs that aliens have visited the human race. Several centuries-old paintings, cave drawings and tapestries contain symbols and shapes that resemble UFOs and extraterrestrials. But art experts say that these are simple misreadings of religious symbols or figures. MailOnline explores some of the most famous examples of UFO or alien-like symbols in ancient artwork. The ‘Annuciation with Saint Emidius’ is an alter piece painted by Italian artist Carlo Crivelli in 1486. It was crafted to commemorate Angel Gabriel’s announcement to the Virgin Mary that she would give birth to Jesus. Conspiracy theorists suggest that the ring depicted in the top left, shining light onto Mary, is a UFO spacecraft. But art experts say that it simply shows a small collection of angels gathered around a circle of clouds. The ring and light represent the holy spirit descending towards the Virgin Mary. Urobune refers to a mysterious, unknown object that was found drifting off the coast of Eastern Japan’s Hitachi province in 1803. The object is depicted in three different Japanese texts: Toen shōsetsu (1825), Hyōryū kishū (1835) and Ume-no-chiri (1844). This illustration depicts the UFO-like object, which Hitachi sailors discovered floating in the ocean. According to the notes alongside some illustrations of the craft, the object was made from steel and glass, and was just large enough to fit a small human inside. Within the craft, the sailors reportedly found a strange script which they could not decipher. This 17th century work by Italian artist Ventura Salimbeni features God and Jesus looking out over God’s kingdom. But the strange, rounded object sat between the two resembles Russia’s Sputnik satellite, launched over 350 years later in 1957. Famous 15th century Austrian Renaissance painter Michael Pacher created this work around a legend that Saint Wolfgang tricked the devil into building a church. Saint Wolfgang was the Bishop of Regensburg in Bavaria during the 10th century. Conspiracy theorists claim that the figure depicting the devil in the painting could be a representation of an alien that visited Earth. But the theory is a weak one, as the devil has been represented in a wide variety of strange forms throughout the long history of religious artwork. Art experts suggest that this painting is a reference to a religious passage: ‘The heavens opened, and the Spirit descended like a dove and (put) lighting upon him’. It was painted by Dutch artist Aert De Gelder in the 18th century. 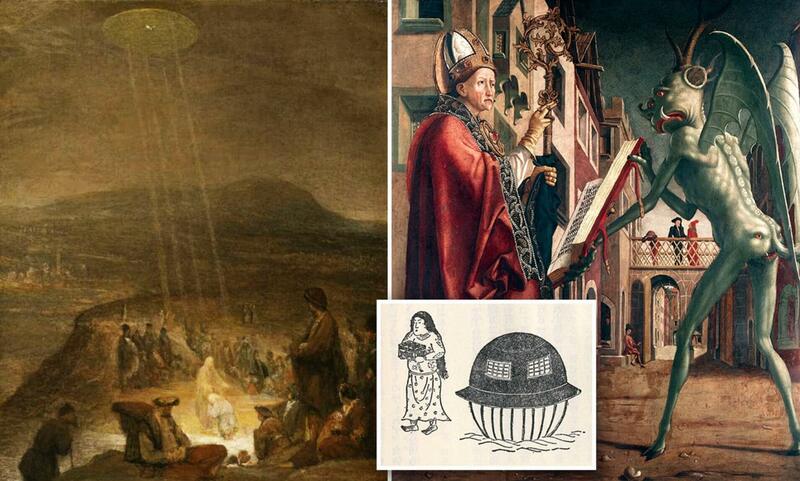 UFO hunters suggest that the disc-like object, shown shining light onto John the Baptist and Jesus, could be a UFO. ‘This scene has been illustrated by many artists,’ says internet UFO conspiracy theorist TheAncientAliens. Ancient Peruvians, such as the Nazca people, are famed for their centuries-old carvings in the Peruvian desert. Many were dug into the South American landscape between the first and sixth centuries. This image shows a 6th century Peruvian hill carving that appears to depict an alien-like figure. It’s theorised that local inhabitants carved these messages into the floor to signal to aliens that they valued their visits. But the carvings are just as likely to have been messages to ancient Peruvian Gods. Nazca Lines are geoglyphs first spotted in 1939 when a pilot flew over the Nasca planes of the Peruvian coastal highlands. They were designated as a UNESCO World Heritage Site in 1994 and the area stretches more than 50 miles (80km) between the towns of Nazca and Palpa, about 400 km south of Lima. Some 700 geoglyphs are thought to have been drawn by the ancient Nazca people between the first and sixth centuries. The Nazca Lines are drawn into lighter coloured strata which contrasts with darker gravels on the plain. In this painting, Italian Renaissance artist Domenico Ghirlandaio depicts Mary mother of Jesus looking down on two children. The artwork hangs in the Palazzo Vecchio in Florence, Italy. To the right of Mary’s head, a strange flying object can be seen in the background, which some UFO hunters think is an alien spacecraft. A Shepard can be seen shielding his eyes from the sun as he points toward it. The object is interesting to conspiracy theorists because it has no other context in the painting. UFO conspiracy theorists CoolInterestingStuff discuss a possible reading: ‘Upon closer inspection, the man seems to be looking away from the UFO, behind him and over his shoulder. But art experts say that artwork of this era often depicted clouds shining divine lights as religious symbols. They suggest that in the case of Madonna with Saint Giovannino, this common biblical symbolism has been misread. THE DWARF ELEPHANT OF MALTA; ORIGIN OF THE CYCLOPS MYTH?